- Apple is seriously going after the enterprise market with full sync with Microsoft Exchange of e-mail, calendar and contacts. This is going to be an enterprise killer as many including myself had been waiting for the integration with Microsoft Exchange. iPhone is already killer device and with this feature, its certainly going to hit hard on BlackBerry. Not only is Apple serious about consumers market, they are equally serious in going after the enterprise market too. - Enterprise improvements covering VPNs, certificates, authentication, WiFi authentication. - Full SDK and development suite with remote debugging tools and device simulator. Games, business applications and an IM client were demoed with presenters stressing the graphical power of the platform and speed / ease of development. - An application store icon will be added to phones to distribute applications (the only way, although they can be obtained albeit via both ‘over-the-air’ or iTunes sync). The store application will also notify user when applications they have installed are updated. Revenue split is 70/30 where Apple gets to keep 30%. Though a little high but existing mobile operators are taking a bigger slice so its really a boon for developers. Developers can choose to distribute free apps once approved by Apple. Apple are also working on an enterprise tool for distributing firms’ internal applications. To become part of the developer program, the developer has to pay $99. - finally John Doerr, partner of world-famous VC firm Kleiner Perkins Caufield & Byers, came up on stage, saying that they will commit $100 million to a fund exclusively for iPhone applications. Whats going to be interesting is to see how the other device manufacturers responding to Apple strategy of building the developers ecosystem. Most had yet to even caught up with iPhone let alone building such initiatives. From my perspective, Apple is doing the right thing as they are the only device manufacturer who not only improves the user experience but at the same time developing an ecosystem for the developers to build the best products and services to its end users. This is monstrous task and a huge initiative by any standard and I hope that Apple will drive it successfully. Apple certainly has the building blocks for making it successful as they have in place a successful and proven commercial platform that makes it possible for a developer to actually sell, distribute, and update their software with the flip of a switch. And don’t forget the customer experience revolution — buying and installation of iPhone software will be as easy as buying music from the iTunes store and this is something only Apple can deliver. The road ahead for iPhone is going to be exciting and challenging as they are the only one driving it differently from the others with superior innovation and aggression. Guess this is the only way to beat their much bigger competitors. 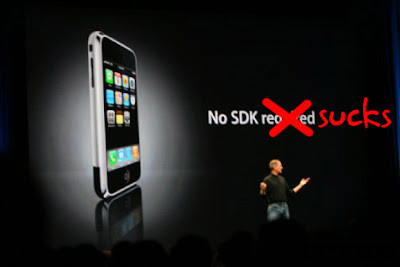 Apple has just uploaded yesterday’s SDK event for your viewing pleasure. You can find it here. Here are some of the clips from the SDK announcements. Cool developments work from Sega and EA.